Meticulous attention has been paid to every aspect of HOPE'S design. Her handcrafted decor is matched by an innovative layout that provides numerous areas for relaxing and formal entertaining in the most elegant feel and comfort. Each of the four owner and guest staterooms are spacious with king or queen beds with ample wardrobe capacity and port lights. Each cabin has its own private bathroom with colour coordinated marble accents. The master stateroom has an office area. Aft of the pilothouse are the Captain's cabin and the Crew cabin. The Captain's cabin has a queen berth and vanity and the crew cabin has two bunk beds. They share a shower and second vanity and separate toilet. The main deck, which includes walk around side decks, is devoted to luxurious amenities and entertainment options for all. Hidden mahogany and glass pocket doors in the dining salon wall open to reveal a showcase centre island galley, with upholstered stools. A large variety of water sport options await each guest. Sport equipment includes: diving and snorkel gear, Bauer dive compressor, and (2) RIB tenders. The cockpit features a dive tank centre. Wheelhouse instruments are empaneled in custom crafted Honduras mahogany and arranged for maximum visibility. There is an elegant 10' settee behind the 3' Stidd helm seats also, for viewing for guests while underway. Tucked under the flybridge overhang is an aft facing settee for al fresco dining protected from the sun, wind and rain. 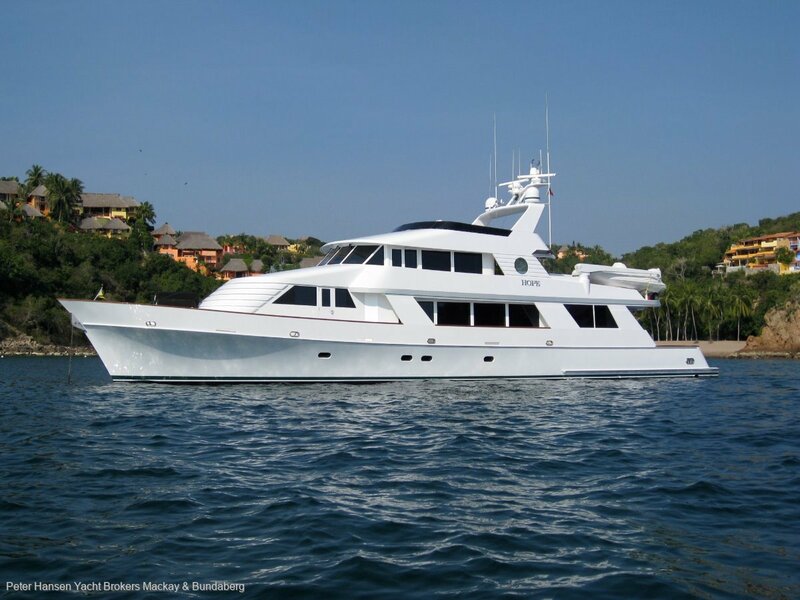 The flybridge has full remote instrumentation and guest seating with stools for (5) and 4 custom sunning beds. Accommodation: Each of the four owner and guest staterooms are spacious with king or queen beds with ample wardrobe capacity and port lights. Each cabin has its own private bathroom with colour coordinated marble accents. The master stateroom has an office area. 46" Samsung Flat Screen TV, Aqua Air Digital Display Marine Air System.